Ben must uncover the secrets of his home, the strange demons that lurk in dark corners, and his destiny as the Master of Old Isle in this adventure from the author of the Tripods series. Ben lives a carefree life on Old Isle, far away from horrible demons that terrorize the people on the mainland. He shares his home with Mother Ryan, Antonia, Paddy, and the Master. They’re not his real family, but they’re the only family he’s ever known. Then, in a single day, Ben’s quiet existence is turned upside down. After the Master dies and reveals a startling connection, Ben becomes the new Master of Old Isle. 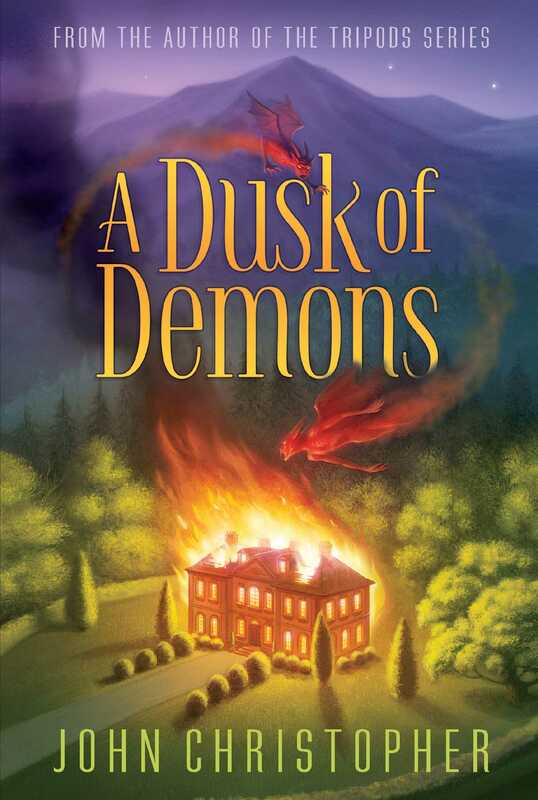 And when demons burn his house to the ground and his family leaves their home, Ben is forced to stay behind. Soon Ben manages to escape and begin a journey across the sea and the countryside to learn the secrets of his heritage. But he is being pursued by people who wish to use his power for their own selfish purposes, and time is running short for him to make things rights. I AWOKE WITH THE EARLY morning sun dazzling my eyes. This was not in itself unusual because my window faced east, but it triggered a sense of something being wrong. There had been a bothering light in my eyes the night before, from the full moon, and in the end I had climbed out of bed and drawn the curtains against its brilliance. Yet they were open now. That was when I remembered the nightmare. I’d had nightmares before, when I was little—I could call up hazy recollections of smoke and fire and fear—but there had been nothing like that for years. I had slept, in those days, in a cot beside Mother Ryan’s bed, and been lifted in beside her to be comforted. Last night, too, Mother Ryan had provided comfort, but she must have come the length of the corridor to reach me. She had sat on the edge of my bed, trying to persuade me there was nothing to be frightened of. In the end, she had left me and gone to the window and opened the curtains to show me there really was nothing out there but moonlight. Even then I had taken some convincing. It had seemed so real! And yet it was a reality without shape. I had known there were things outside but could not tell what sort of things they were. All I was conscious of was that howling, ebbing, and swelling as they circled the house. Each time it died down I thought they might be going away, but each time they came back and there seemed to be more of them than before. My one concern was to escape—hide under the bed, or better still run and find somewhere in the house where I could not hear them. But I could not even sit up; my legs refused to move, and a dead weight pinned my shoulders. Then the shapeless voices stopped circling and were wailing monstrously against my window. Glass could not hold against such a volume of sound . . . and as I thought that, it shattered, and I knew they were in the room with me. I suppose that was when I started yelling, still not knowing what they were and not daring to look. It seemed a long time before Mother Ryan was beside me, telling me to hush, it was only a bad dream—urging me to open my eyes and see there was no one there but her—no sounds except those of the distant sea and the wind in the pines, and her voice, part chiding but more reassuring. Had I been thinking clearly, it would have surprised me too. I’d known he was drunk when he came in, from his careful stiff way of walking. I hadn’t believed a word of his ramblings about the black Demons, and the way they winged across the night skies, hunting for sinners—children especially—to take back to their lairs in the moon. Paddy and I had laughed about it after he’d gone, over our bedtime milk and biscuits. She must have stayed with me till I fell asleep. Wide awake in daylight, I writhed at the thought. If the noise I’d made had been loud enough to rouse her, Paddy might have heard it too. And Antonia. I visualized the little twist that lifted a corner of Antonia’s mouth when she was hiding a smile—or pretending to. Paddy and Antonia were Mother Ryan’s daughters—no kin to me but, since I had lived with them all my life, almost like sisters. Elder sisters: Paddy by eighteen months, Antonia more than four years. Antonia was tall and thin, with fair hair that until recently had been kept tied back in a bun but was now let down, falling to the middle of her back. She had sharp gray eyes, quick and impatient movements. When she was angry it was in a held-back way more alarming than Mother Ryan’s hot bursts of temper. I doubt if anyone would have taken her and Paddy for sisters. Paddy was more sturdily built and ruddier; she had blue eyes, thick black hair cut short, and a much greater inclination to talk and laughter. We fought quite a lot because she had a bossy streak, but we did nearly everything together. I could not imagine life without her, though for that matter it was impossible to imagine life without any of the people among whom I had grown up—Mother Ryan, Antonia, Andy, and Joe, even the remote forbidding figure of the Master. That morning, after we had our own breakfast, Paddy and I went down to the little paddock to give Jiminy his. Jiminy was a horse, swaybacked and nearly blind, who had been put out to grass. We took him his favorite snack—a sandwich with jam from last summer’s plums—and he performed his usual trick of whinnying when he saw us coming, then backing away and circling before returning to the fence, yellow teeth bared in a greedy grin. We went through the routine of feeding him and stroking his still velvety muzzle, but it wasn’t the same. There had been an awkwardness over breakfast, and it persisted. Eventually I moved away toward Lookout, the highest point on the island, with Paddy following. Apart from a bank of cloud far off in the east and a few small clouds on the western horizon, the sky was blue, the air warm and carrying scents of spring. From Lookout one could see all the other islands. Sheriff’s, the only one with more than two score inhabitants, lay southeast across the central bay. John’s and Stony were to our left; to our right, Sheep Isle and West Rock and January completed the ragged arc. Some of the names were self-explanatory: Stony was stony indeed, the green turf of Sheep was studded with white shapes, and it was from Sheriff’s that Sheriff Wilson governed all the isles except the one on which we stood. This was Old Isle—I didn’t know why except that it had a ruin much older than those on Sheriff’s, which we knew were left over from the Madness. It was built with stones that bore the marks of hundreds, perhaps thousands of years of weathering. We had explored all the islands, summer by summer. At one time we had been obliged to rely on Joe to take us, but since the previous spring we’d had the use of a small dinghy and could, with Mother Ryan’s permission, roam freely. We had planned to camp a night on John’s during the coming weekend. Paddy chattered while we looked out—about when Liza, the tortoiseshell cat, might have her kittens; about Bob Merriton, who had come over from January to court Antonia but been quickly mocked into a shamefaced retreat; about the school of seals Joe said had come into the bay on the far side of Stony. But her chatter had an uncertain note, and as is likely to happen with people who are using words to fill an awkwardness, in the end she ran out of them. The silence that followed was heavy. She broke it with a yawn. I knew she was trying to make things right, and while I still nourished resentment, I was happier. However much we fought, I could be sure of Paddy being basically on my side. And there was some relief in having it in the open. Paddy laughed, but it wasn’t entirely a joke. It was hard to imagine even Demons taking on the Master. We had come to the ruins, and a couple of early butterflies—clouded yellows—waltzed overhead, spiraling up past a pillar of crumbling gray stone. I was certain of that. Discussing Demons in an abstract way was one thing. I couldn’t begin to talk about the howling and my impotent panic. Awkwardness started to come back. Later that day Andy brought me disturbing news: I was to accompany the Master on his customary afternoon ride around the island. On my previous birthday, the Master had surprised me by giving me a present, in the shape of a pony. He had not previously marked such occasions for any of us. There always was a present which was supposed to be from the Master, but we knew Mother Ryan had made it or got it from Sheriff’s and wrapped it up before putting the Master’s seal on it. And a pony was something special. Joe had brought it across secretly the night before, but the Master himself summoned me to the paddock and handed me the reins. He didn’t say much, only, “So you’re fourteen, boy. On the mainland, they would call you a man.” Then, without waiting for thanks to emerge from stammering confusion, he turned and walked away. Antonia had just been scornful; for two or three days afterwards she greeted me by dropping her voice and saying, “On the mainland, they would call you a man.” I don’t think she minded my being given the horse; she was not fond of animals and shooed the cats away if they ventured into the parlor. Paddy, though, had been resentful at first, pointing out that all she’d had for becoming fourteen was a new hat. But she got over it quickly, principally by treating the pony as if it were a present for the pair of us. It was she who provided him with a name, Black Prince, and when Andy taught us to ride him she learned faster. She was older, of course. The Master’s own horse was a big gray gelding named Sea King. Andy called him willful, but he seemed docile with the Master’s hands on the reins. I had only looked on from a respectful distance and found it hard to take in Andy’s instruction that I was to join him. The direction was for meeting at North Point. As I came up to him, I said, “Good day, Master,” and put a hand to my forelock. He nodded silently and clicked his tongue for Sea King to walk on. For several hundred yards the path lay inland, before emerging to where the sea lay directly beneath us. He halted there. The western cloud had thickened, but the day was mild still. I was thrown once more into confusion. The Master’s quarters were at the far end of the house, and it had not occurred to me he too might have been wakened. He stared down at me. He was more than six feet tall, his horse better than seventeen hands to Black Prince’s thirteen and a half. Letting go the reins, he rubbed his hands together slowly. I had no trouble answering that. At the foot of the back stairs, pencil lines on the plaster marked where Paddy and I measured one another, regularly on birthdays and quite often in between. His voice was deep, and his manner of speaking strange. As Mother Ryan’s was, but in her case we knew the reason—she was proud of being born and raised in Ireland. The Master’s accent did not resemble either hers or the local one, which was also my own. It took me a moment to grasp the question, and “here” perplexed me. Where else should I be? Again I was puzzled. This was the spring holiday, but normally Paddy and I were taken daily to school on Sheriff’s in Joe’s fishing dinghy. An honest answer would have been very little if anything, but I knew better than to be strictly honest to a questioning adult, particularly to the Master. He sounded as though he really wanted to know, which in itself surprised me. I had taken it for granted that, with a large room lined ceiling to floor with books, he must be the wisest person I knew—far wiser than our teachers, or Mr. Hawkins the Summoner, or Sheriff Wilson. But he had put the question, and I had better answer it. I followed him back on Black Prince, disturbed but intrigued. Would the talk be in his library? I had ventured there once while he was away on Sheriff’s, and the close-packed volumes had fascinated me. There was even a set of wooden steps, spiraling around a pole, to get at those too high to reach. Mother Ryan had caught me peering and pulled me away by the ear. It was, she scolded with a sharp tweak, a spot forbidden to any but the Master. All this took place on Tuesday. The new term started on Friday, which meant just one day before the weekend break. I had fingers crossed for our camping trip: The weather had broken, and Mother Ryan fastened our oilskins on a rain-smeared morning. Joe greeted us at the jetty. That had been my suggestion. It was usually Paddy who thought of names, always Paddy who decided what the name was going to be. The dinghy smelled of the catch he had landed earlier, a tang of fish mixed with salt and sweat and tobacco. Joe was almost as tall as the Master, and broader, with a battered face and a big nose and thick black beard. He set sail to catch the stiff northwesterly, and we heaved our way across the bay with gusts of rain stinging our faces. I glanced surreptitiously at Paddy. I had got over being seasick, but she still suffered occasionally. She seemed all right this morning. I looked back toward the house, where smoke rose from two small chimneys at the north end and a larger one at the south. The Master would be sitting by his study fire, drinking the coffee Mother Ryan took him about this time. I’d never tasted coffee—it was not for the likes of us, Mother Ryan said—but loved the smell. Perhaps he would be reading one of his thousands of books. I wondered when the summons for the talk might come. This being the first day of school, Sheriff Wilson addressed us. He reminded us of our duty: to obey our parents and those in authority, all adults, in word and deed and thought. We were to work hard and to learn—learn especially those things through which we might escape the wrath of the Dark One, in this life and the life to come. Work hard, and learn well! He too was big, but fleshy. He had a high forehead, fat cheeks, and spectacles whose lenses had no rims. He picked me out as I headed toward the classroom. He was smiling, but he smiled easily. People said he was the best Sheriff in living memory, more easygoing than his predecessors. The stocks which stood across the green from his house were empty more often than not. I thought I ought to like him, but could not. The tone was solicitous, but I didn’t believe the hope was honest. I had once observed him in conversation with the Master, and though I could not distinguish their words, there had been contempt in the Master’s voice, wheedling unease in the Sheriff’s. I spoke warmly and thought his eyes narrowed behind the rimless lenses, but he smiled still more widely and patted my head to send me on my way. Although I would not have preferred to live there, I found Sheriff’s an exciting place. Apart from ruinous mounds from the days of the Madness, fascinating forbidden territory, there was the bustle of people, and there were shops. The Hesperus, which took produce to the mainland and brought back other goods, had recently returned. Paddy and I found mainland sweets tastier than the Widow Barnes’s fudge, and with hoarded pennies we bought sticks of toffee studded with hazelnuts. We munched our way happily to the quay, where Joe was waiting for us. I began to rattle off an account of the day, but Paddy interrupted. When I looked, his expression was troubled. He turned his head away. Yet now I could read his grimness too, and knew it was.